The rear window curtains are finished and hung! As with everything else so far, they are non-standard. Are they better? Maybe, maybe not. Only slightly crooked—less crooked than I thought they’d be. I’ll take you through a step-by-step of how I made them because … why not? 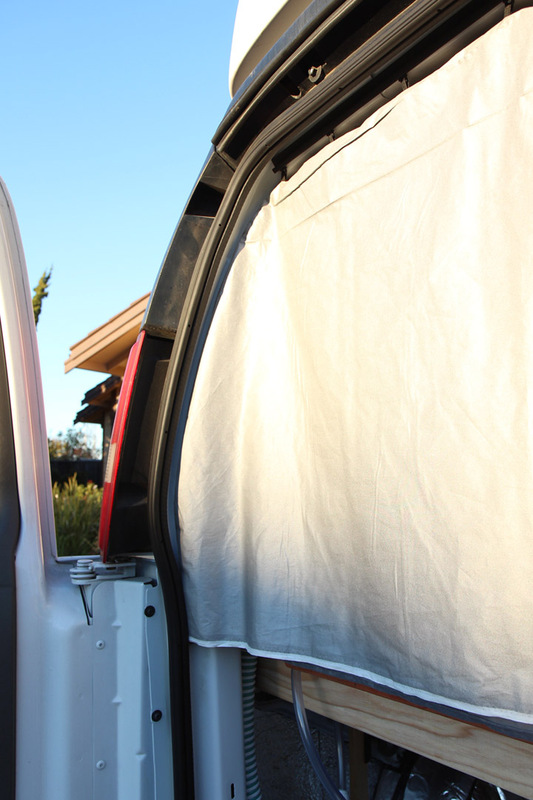 The Chevy Express rear door opening has some contours that I wanted the curtains to conform to, so I took the time to carefully outline the opening and cut the fabric to match. 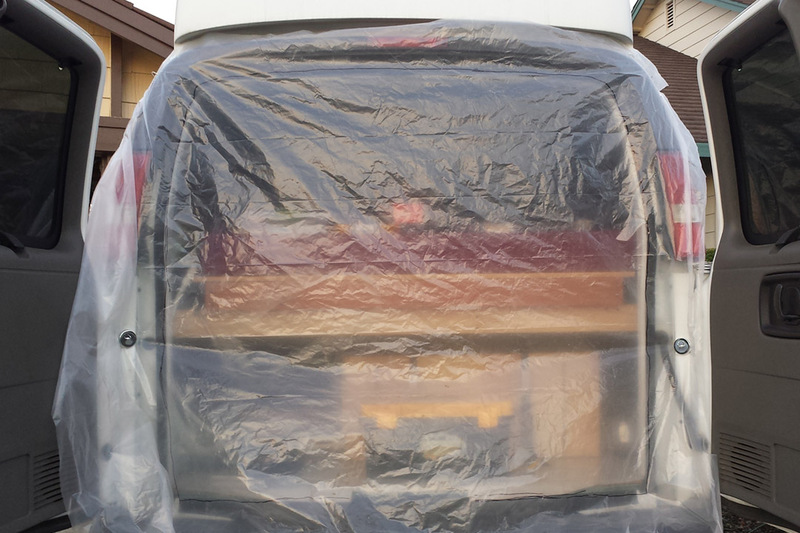 Using a few strong magnets, I hung clear plastic sheeting taut over the opening. Then, I traced the outline with a Sharpie. While it was a very non-scientific method, it was much easier than the standard method of measuring, re-measuring, writing numbers down, getting numbers mixed up, transferring them to fabric, etc. 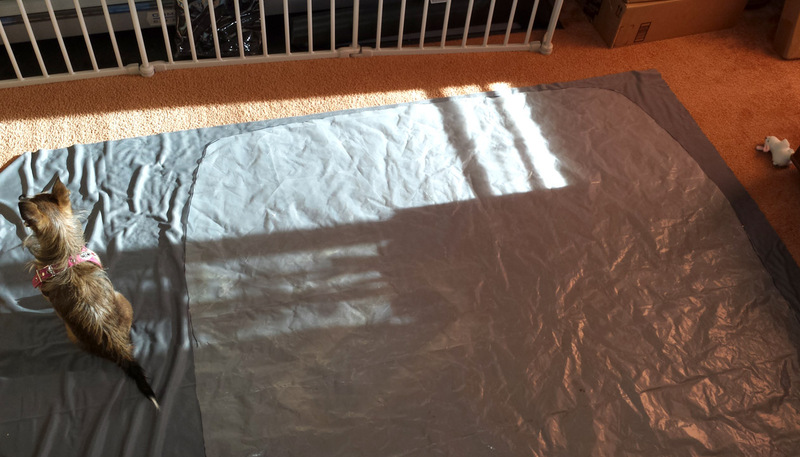 After cutting out the plastic sheeting template, I laid it over the fabric and used it as a guide to cut the fabric. 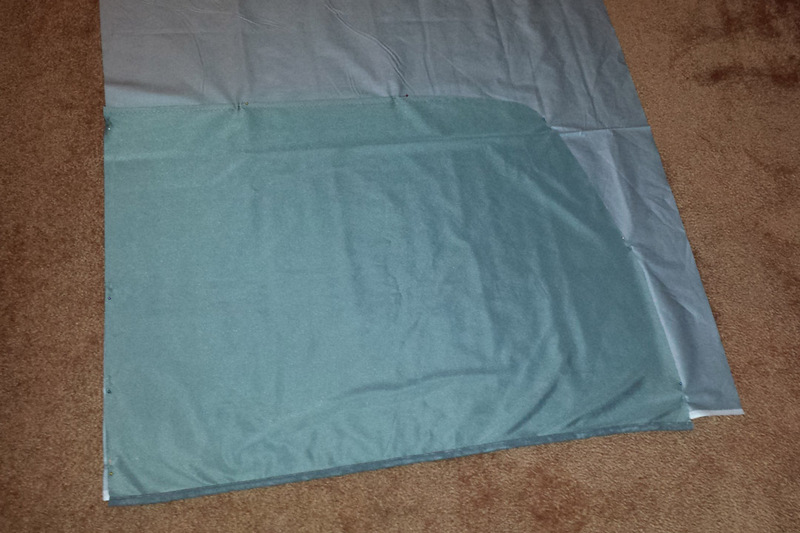 I added an extra 6 inches on each side to account for overlap in the center and along the sides. 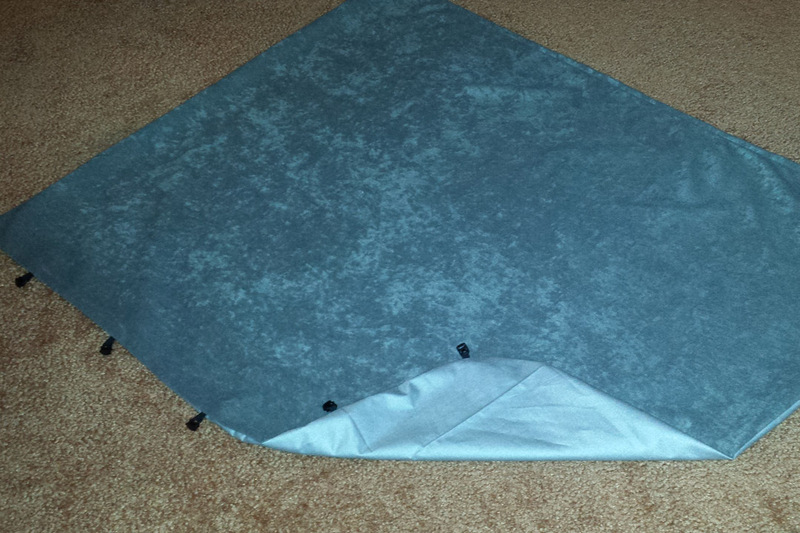 Hemming rounded corners didn’t sound fun, so I decided to avoid the whole situation by adding a liner. This way I could sew the two faces together and simply turn the entire thing inside out (er, right side out?) as if it was a pillowcase. You sewing experts will know what I mean. For the liner, I chose ironing board fabric. This heat resistant fabric is also used to make oven mitts and pot holders, so I figured it might help insulate the windows a bit. Is that a ridiculous idea? I don’t know. In any case, it’s shiny. Ooh, pretty! 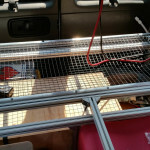 The curtain tracks are from curtain-tracks.com, and I attached them to the van with some almightly VHB tape. 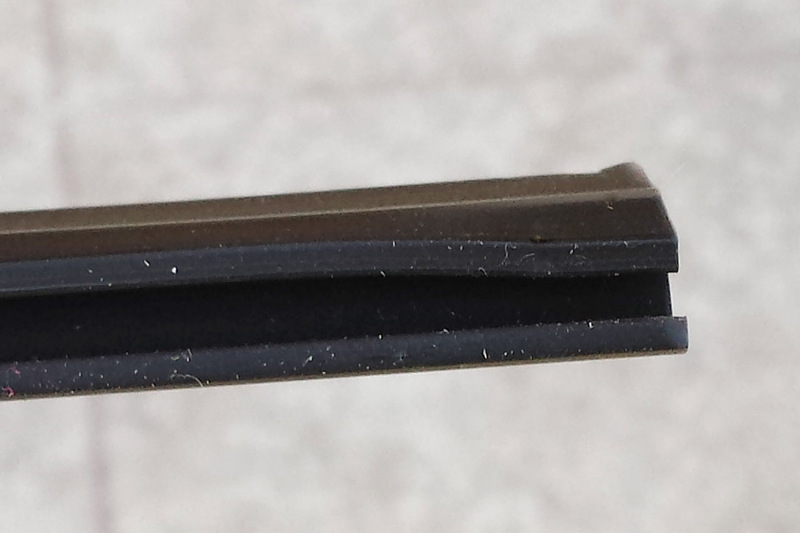 A pair of ratcheting pipe cutters easily cut the plastic curtain tracks to the right length, and also did me the favor of bending the corners in just enough that the slides can’t fall out of the track, but still pop in with just a little bit of effort. Nice. 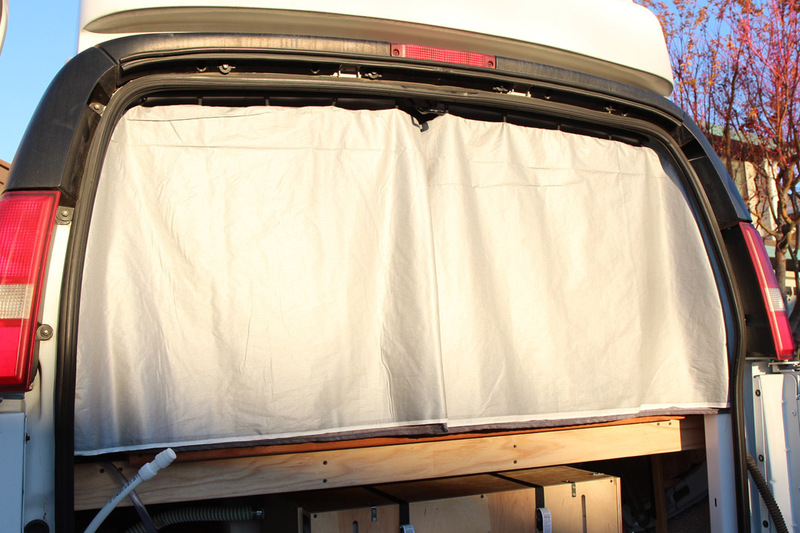 The sides of the curtains have magnets sewn in to them so that they cling to the frame of the van, and avoid spilling light into prying eyes when in stealth mode. 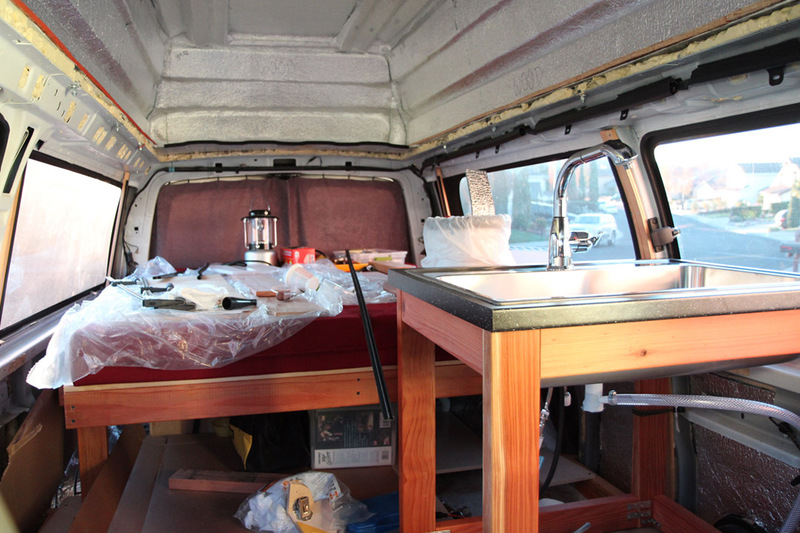 I’m happy with how the rear window curtains turned out, and could probably now make the curtains for the other four windows with relative ease, but I think I’ll mix it up a little and tackle something else next. There is, after all, lots to do.